Our experience gained over the last 15 years cleaning carpets in some of Sydney�s largest private hospitals and other healthcare facilities has given us an insight into what we believe, are the most important points when taking care of the carpet in your home. Our systems provide you with the absolute best possible results, returning your carpet to as near as possible to the condition they were in when first installed. We offer a number of different types of cleaning methods from Low Moisture Systems, Absorbent Powder through to Hot Water Extraction (Steam). Remember, not all carpets are the same and need to be cleaned according to fibre type and construction method. We can quickly test your carpet and advise on the most suitable method. There are many steps to a clean carpet below is an example of our Top Shelf Clean. This is to identify the fibre and carpet type so we can make the right choices of cleaning methods for your situation plus address any issues or concerns you may have. Always use an upright "Power Head" style vacuum that has a High Efficiency Particulate Air (HEPA) filter. This takes out 99.97% of dust particles down to .3 of a micron. An often overlooked part of the carpet cleaning process, proper vacuuming is critical to removing dry soiling from you carpet. Cleaning solution is applied. We only use non-toxic, biodegradable cleaning solutions for both your safety ,the technicians safety and the environment. This is another critical step most often missed. The cleaning solution must be agitated to suspend the soiling off the carpet fibre. Its kind of like trying to wash one hand, yes you can put the soap on and even rinse it off but without the other hand it just doesn�t work properly. Hot water extraction is sometimes incorrectly called Steam Cleaning. This is where the soiling which has been suspended can be rinsed out of the carpet. Your carpet has now been rinsed clean but often there are still fine particles caught up in the fibres. It removes any dirt residue which may be left on the carpet. 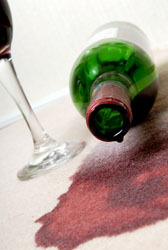 It heat bonds (85 degrees C) a Stain Block onto the carpet fibres, kind of like an invisible barrier to staining. Appling a stain block in this way is the only process available away from the factory which mimics how the carpet mill first applied a stain block. You know how when your carpet was new it repelled stains, well now you can have a Stain Block properly applied every time you get your carpets cleaned. The Stain Block that has been applied also contains an anti microbial that is safe for your family and pets. It helps control Bacteria like E-Coli and Staph Aureas, Moulds and fungi such as tinea (athletes foot). Because your carpet is heated to 85 Degrees C to apply the Stain Block and Anti-microbial it also removes a great deal of moisture cutting down the time it takes for your carpet to dry. This is to make sure that the carpet pile is reset to not only make it look fantastic but also it will decrease the time it takes to dry. As you can see in this illustration of a typical dirty carpet ,the carpet has loose dry soiling that will be removed by our powerful vacuums, as well as the soiling that is bonded to the fibre. Loose dry soiling has now been removed leaving only bonded soiling which will be removed by Hot Water Extraction and the Final Clean process. So there you have it, the ultimate clean. Is that something you could use? GIVE US A CALL!! !